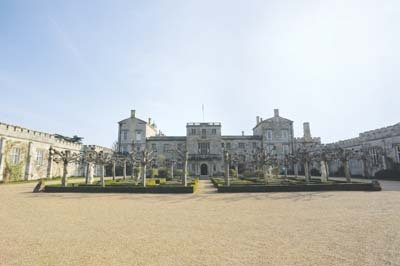 F&C were invited, by Bucks New University, to accompany Dr Campbell Norman-Smith and his MA Furniture Conservation, Restoration & Decorative Arts students to the beautiful Wilton House. The purpose being, to undertake a survey of some of the exquisite, historic furniture in this most special house. It was an opportunity to look at the processes that are usually done behind closed doors, to preserve impact. Our thanks go to both Dr Norman-Smith and those at Wilton House, for allowing us to witness these highly skilled techniques in action. I asked Dr Norman-Smith what criteria he used to decide how much work to do. "This is a very topical area which we tend to simplify. We aim to minimise the level of intervention, sufficient only to return the function to the object. What will constitute function depends very much on the piece and its context. For example, whether it's purely functional in the traditional sense of decorative function (as a table to hold up weight or a chair to be sat on), or as a representative of a historical context or construction." 1. "If the object is in a working house it has to be fit for function, therefore the appropriate conservation work will be undertaken to enable it to perform that function." 2. "If itâ's viewed by the public and has to be aesthetically pleasing, the appropriate stabilisation would be undertaken." 3. "If it's a decorative object e.g. gilded, the appropriate steps will be taken to stabilise its deterioration and match in the correct tonality of the missing gold." 4. "If the object has received previous restoration work which has affected its structural stability, this will be restored to overcome the problem (e.g. the console table)." 5. "In regards to the work that was undertaken at Wilton, a lot of previous repairs were removed and reinstated in the correct manner, such as the removal of metal brackets and bandaging." 6. "All the materials that we use are fully reversible, with the exception of Plextol, which is an acrylic consolidant which we used to stabilise lifting gold and gesso." 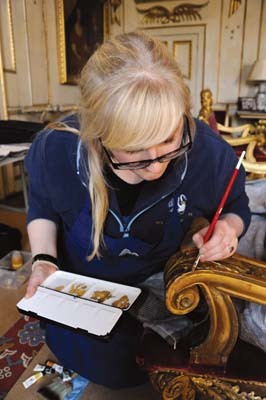 An example of this approach to conservation, which can be seen on display at the Wallace Collection, is the Compte D'Artois chair from Waddesdon Manor. 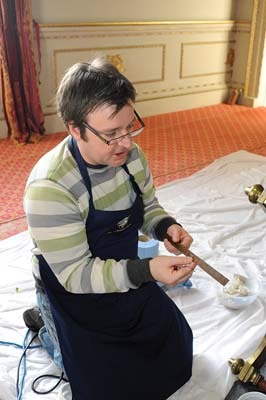 The first item that I saw was a silver-gilt table being worked on by Shelly Seston. Silver leaf is, in a way, more striking than gold leaf because it's used less often. The picture below shows the reverse of the carved decoration. There are old wooden straps or splints and two recently fitted ones. This technique of building up a strap behind the carving to secure a broken area is legitimate, provided the new work is obvious and is attached using a reversible adhesive such as animal collagen glue. Akira Yoshioka was also working on the silver leaf table. I watched as he carefully cleaned off the end of a wooden dowel used to secure a strap. To give you some idea of the scale, cocktail sticks or slightly stronger kebab sticks make superb delicate dowels. The conservators use some ingenious cramping arrangements to hold the straps in position until the glue's dried. Note the red rubber band around the splint holding the two pieces of the carving in register. The Double Cube Room at Wilton House was a temporary, makeshift workshop adopted by the students while carrying out the work before the house opened to the public. 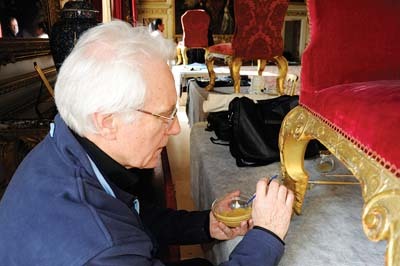 Johnny Hellyer was using animal glue to repair a Boulle style bureau Mazarin. This decoration is formed by cutting brass and tortoiseshell in a pattern. Again, animal glue is used. 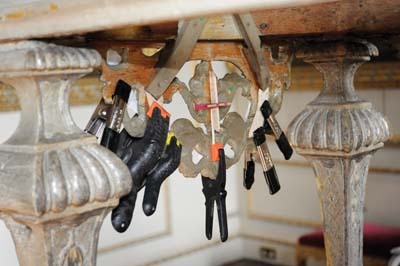 The advantage being that future craftspeople will be able to reattach loose decoration using the same techniques for loosening and re-adhering old glue. Perspex is used under the cramps to allow the register of the repaired piece to be seen. In some instances the blocks are warmed to soften the animal glue adjacent to the repair to help the new glue adhere. Not all the work could be carried out in situ within the time available to the team. Johnny produced several rubbings as part of a technique used to reproduce missing pieces back at the university workshop, to be fitted to the piece on his next visit. 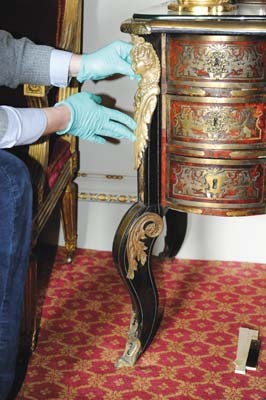 See the gilt-bronze (ormolu) mount on another small bureau that has been cleaned and is ready for re-attachment. In contrast an un-cleaned foot mount is visible below. The cleaning of these components is carried out very carefully in an ultrasonic tank using special solution. 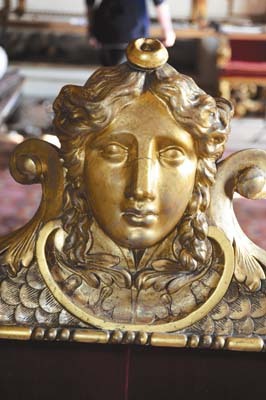 The layer of gold on gilt bronze is very delicate and should never be abraded in an attempt to clean it, nor should ammonia be used as this causes tiny cracks to appear. 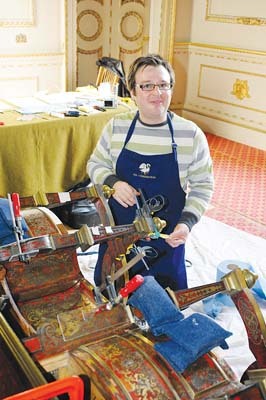 Purnima Patel and Malcolm Bevan were toning in repairs to the gilding on a set of eight George II chairs using gouache. The gouache is water based and can be removed in the future, which accords with the reversibility principle of all conservation work. Like polish or paint, no two golds are the same but with a trained eye and delicate touch a blending of the colour can be matched. Once varnished it will hopefully be indistinguishable to anyone but an expert. 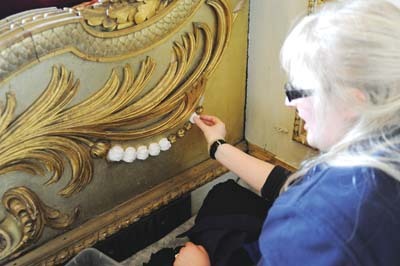 Elsewhere Lucinda Page was working on sections of an elaborate design on the end panel of a sofa. Fortunately the missing pieces were still in tact on the other end so replicas were cast in plaster from these original components. 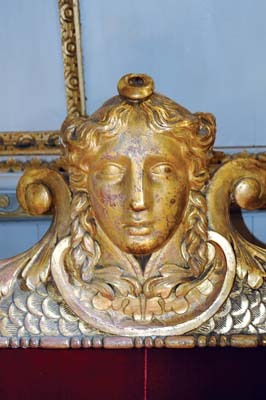 The two heads pictured are on a suite of early 18th century William Kent furniture. The first head is in fact a 19th century replacement and the second is original. It's often hard to tell the difference between 18th and 19th century work. However the second head has gentler, more attractive classical features. 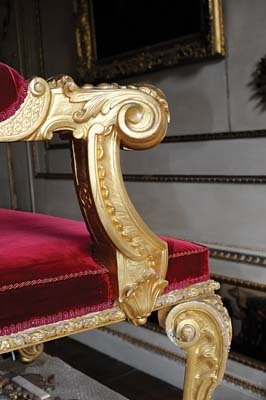 The carving of the lappets within the 'C' scroll is not quite so crisp on the later head and the triangle below the chin is not as well formed. These are small differences, but important ones when looking at carvings. The 18th century carvers were freer and more flamboyant. Where else would you get a chance to make these comparisons other than at a collection open to the public? Campbell had identified a side table that had very loose joints. As the table had a heavy granite top the joints were glued up and strengthened with replacement blocks. However the new blocks could easily be removed in the future, so the concept of reversibility was observed as well as structural stability being maintained. Ian Newman was working on a marble top for one of a pair of side tables. 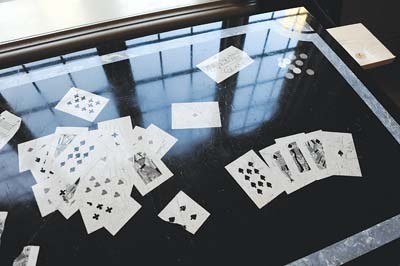 The playing cards are made up of a composite material that sets hard. 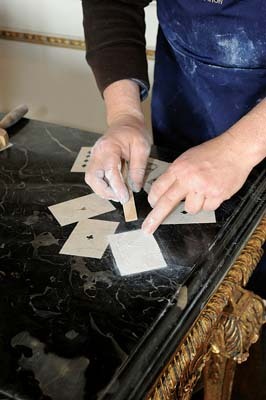 A recess of the correct shape is cut into the marble and the composite is let in. Sometimes solid stone of contrasting colour is used. We watched Ian as he repaired a damaged area that had been filled and prepared to paper it back, level with the surrounding surface. Note the card with writing on it. This is the maker's signature. The technique is essentially marquetry in stone. I asked Campbell what he was looking for in new students and his response was, "Associated experience in the field of furniture, but I have taken students in the past with art history degrees who have done extremely well. I'm looking for a high degree of dexterity and a passion for the subject area. The ability to integrate into a group is essential. The interview takes a day, and they get a full idea of how the course functions and undertake some practical exercises to demonstrate their dexterity." 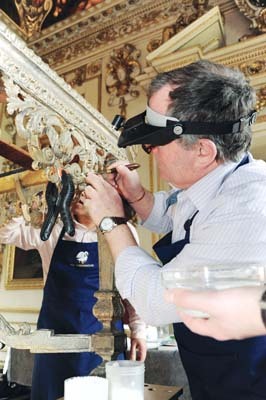 The purpose of the live project at Wilton is to prepare the students for having to deal with difficult problems away from the comfort of the studio, having to adapt techniques to an on-site environment and work under the scrutiny of the general public and the custodians of the collection. 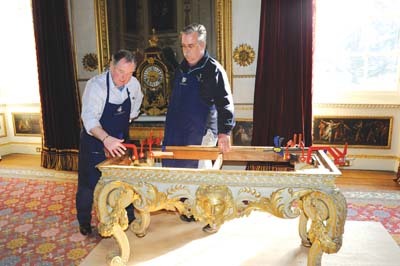 Wilton House is open from 22nd April 2011 - 1st September and 4th September 2011. Sunday to Thursdays inclusive and Saturday, 27th August 11.30am - 4.30pm, last admission 3.45pm. (Grounds closed Sunday 14th August 2011). Grounds open 10th April - 4th September daily plus weekends in September from 11am - 5.00pm, last admission 4.30pm. Full details can be found on the website. If you are interested in this sort of conservation work, contact Bucks New University on 0800 056 5660 or visit the website.